Get simplicity all in one with our Amish handmade Mission Pier Group Bed! 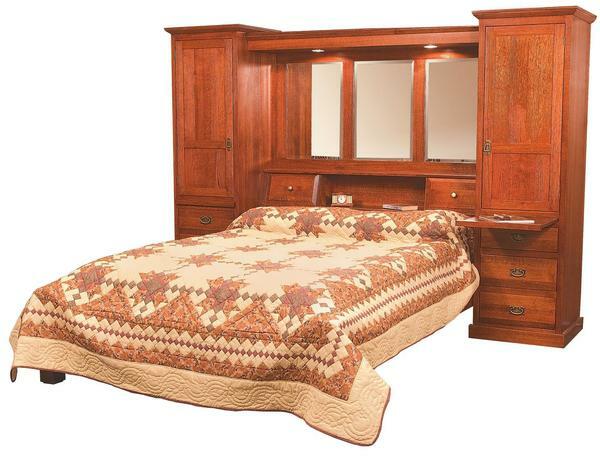 This beautiful mission style pier group can look wonderful in any master bedroom and provide you with central storage that you can appreciate! This pier group bed in oak wood with the michael's cherry stain can be handmade in a variety of different hardwoods and finishes. Please let us know if you would like assistance for matching up a hardwood and finish that would look magnificent in your bedroom! Our toll free number is 866-272-6773. Email us at Questions@DutchCrafters.com.